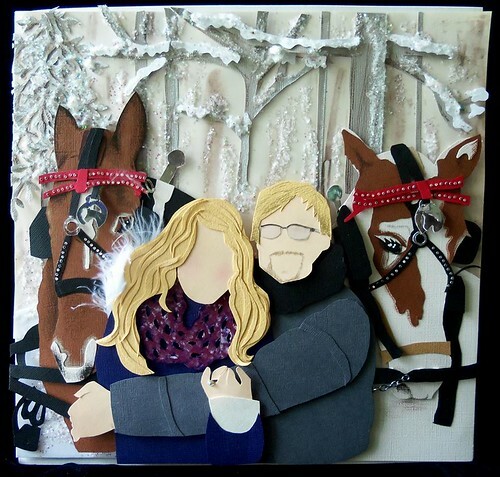 Rosa O. Clifford of ROC Paper Scissors in Florida began creating handmade cards as a way of thanking caregivers who provided therapy for her youngest son who has Down's Syndrome. Interested even as a child in starting a greeting card business, Rosa studied at a commercial art and advertising college in Bogota, Colombia, but became a television actress for a decade there before returning to the U.S. where she married and is now raising a family. To call a personalized portrait that Rosa lovingly hand crafts a 'card' is something of a misnomer... it is much more than that. Each is completely customized and can take two or three days, sometimes even longer, to complete. 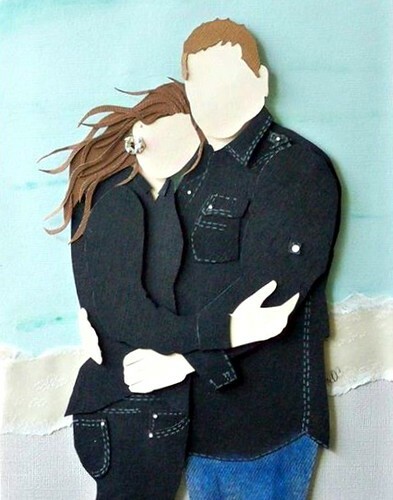 Custom paper portraits have been commissioned to celebrate a special person, occasion, or place. I can't imagine one not being framed by the recipient! 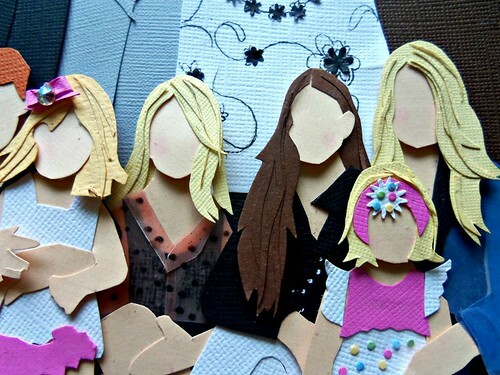 ROC Paper Scissors recently placed extremely well in the Martha Stewart American Made contest. 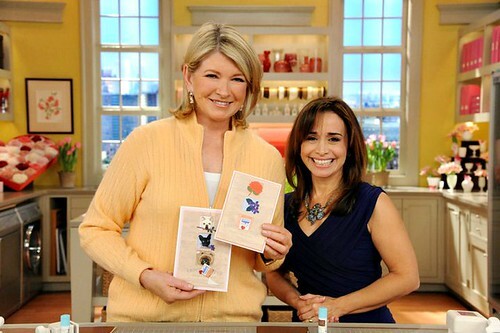 In fact, you might remember Rosa from appearances she made on The Martha Stewart Show three years in a row where she demonstrated handmade Valentine's Day cards. 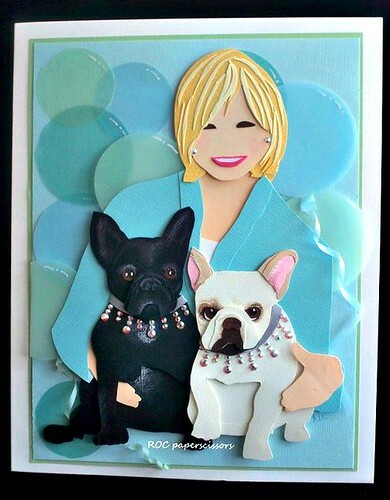 This is a card Rosa made for Martha that shows her with Francesca and Sharkey, her two beloved French bulldogs. I think it looks so much like them! 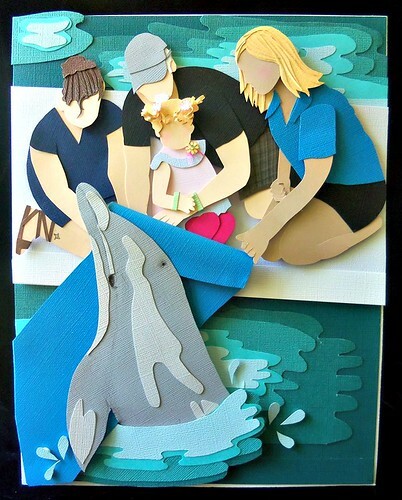 Rosa has designed specialized cards for engaged couples, family generations, and as vacation remembrances. 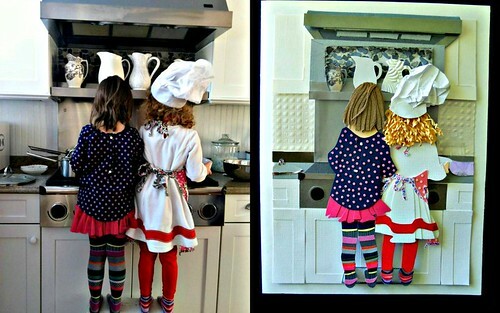 She has a knack for translating a cherished photograph into something even more memorable. I was curious to know more about her special cards so I wrote to ask a few questions. Rosa, please tell us about your process. I consult with a client via email and/or phone to gather details, talk about the kinds of materials I use, and I often receive a photo to reference while sketching the design. I make the cards in two sizes, 8 x 10 inches or 12 x 12 inches. 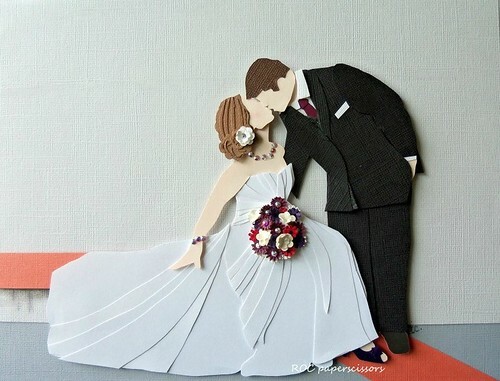 Do you have a favorite cutting knife, glue, and card stock? I love Bazzill cardstock and use it a lot! Very small scissors are probably my most used tool, along with a variety of craft products and adhesives. I can use up to five kinds of adhesives depending on the design; foam dots are very useful for layering. I'm always on the lookout for craft punches and ways to use them creatively, including the smallest ones to bring a variety of proportions to my work. I don't own a die cut machine nor do I use die cuts... hand cutting and working with punches are what make my designs unique. With a busy family life, how do you manage to find time to fulfill orders? Our day starts early getting our youngest on the bus to his Special Center School. My husband works from home as well, and I home school my teenager - thank goodness he is a very responsible and self-sufficient student. Once everyone else is taken care of, I work until our little one is dropped off in the late afternoon. Occasionally I will work in the evening once he is in bed. A lot of time management and planning goes on in our household on any given day! This video tells more about Rosa's family and card making. ROC Paper Scissors can also be found on Facebook. These make great keepsakes. Charming! These are amazing.. love every single piece ..great idea of handmade cards with sweet memories.. really inspired so much with these cards..
these are really awesome !!!!! Beautiful post Ann. Each of her work has so much details and dimension that I can't stop admiring them. The photographs do become more delightful . Thank you for your very kind, thoughtful and comprehensive blog post. Rose's attention to detail and care in crafting the people and places or things important to them in her paper portraits is reflective of just how precious, highly valued and unique they are in the eyes of God and those that love them!